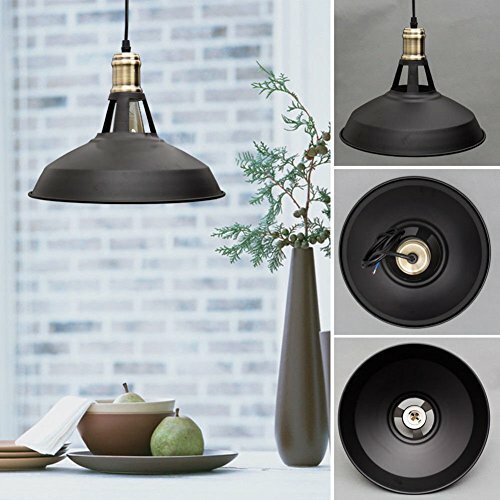 Then this multi-functional SUN RUN Industrial Ceiling Light with its cool design is for you! Note: BULB EXCLUDED in this package.Base E26 bulbs (Edison Bulb recommended) are available at SUN RUN, bulb ASIN: B01LW9S0UG. Do not switch on before assembling. If you want to change the bulbs, please switch off and after the bulb is cold. A CONVENIENT INSTALLATION PACK: The light suitable for E26/E27 bulb(Bulb Not Included), Bulb types available include: LED/CFL/Incandescent, Recommended maximum per bulb power: 40-60W, The voltage of this light is 110-120V. This Industrial Ceiling Light kit comes with everything you need to install, it takes you only about 10 mins to get the job done! OUR CUSTOMER MONEY-BACK GUARANTEE: With its metal cover, this Light Shade is well-made and sturdy. If you are not satisfied with the SUN RUN Industrial Ceiling Light, just return them within 30 days for a full refund. No questions asked, no hassle. Click the Add to Cart button to have your light shade shipped today. If you have any questions about this product by SUN RUN, contact us by completing and submitting the form below. If you are looking for a specif part number, please include it with your message.